Anything from going over the bars on a mountain bike to having an accident on rollerblades or a skateboard can lead to a dental emergency, and the pain can really catch you off guard. We provide a portal and referral line that makes it a snap to locate an emergency dentist in Tulare CA, when many others are closed and the pain is worsening in the middle of the night. If you have a dental emergency on a Saturday or Sunday, we realize just how difficult it can be to find a clinic that is open, and ready to admit you right away. Don’t waste time browsing through countless listings, and let us come to your aid today! Tulare is located right in the heart of the Central Valley, and is named for what was once the largest freshwater lake west of Illinois. The movement of product has always been a key element of the city, as the Los Angeles and San Francisco ports are just 200 miles away each. During the early 1900s, Tagus Ranch was the largest fruit ranch in the entire world, just one sample of how fertile and positively yielding the land here has been right from the beginning. Some top employers that are leading the area with consistently high number and growth patterns are Land O’ Lakes, Nestle, Southern California Edison, Saputo, United States Cold Storage, Kraft Foods, and Tulare Cultured Specialties. Many visiting here are immediately won over by the dozen historical murals that are scattered throughout the city, which depict historical scenes that displaying the history and growth of this very ripe agricultural area. If you fail to reach an urgent care dentist from our entries, make sure you phone our 24 / 7 hotline referral service for dentists working weekends or nights in Tulare. 24 hours a day, Seven days a week you’ll be able to reach the providers at our urgent care dental hotline, simply just call today and get put in connection with a Tulare after hours dental clinic. The dentists that work in these clinics are always kind enough to let us know which emergencies they are seeing the most frequently, and we are happy to pass this information on to our patients. A possibly broken jaw is an ailment that shows up quite often, and there are more than two dozen different ways in which the jaw can be injured! They all require individualized plans of care, and when it first happens, you may not be able to close your jaw or align your teeth properly. You can apply a cold compress to control swelling, and stabilize the jaw with a bandage tied to the top of the head, but you absolutely need to see the dentist right away. Visiting an emergency dentist shouldn’t be too different from a regular trip to the dental clinic.One of your priorities should be to call ahead of your appointment in order to be ready with the proper paperwork that the receptionist will request from you upon your arrival. The dental office you visit should be administered by employees who are used to expediting service because of the emergency nature of the visitors to their clinic, so they should move you through quickly. These dental care listings here are highly recommended by Emergency Dentists USA and all of these emergency dentists possess some sort of after hours sessions as well as evening and weekend care, however, not all of them will be 24 hours. 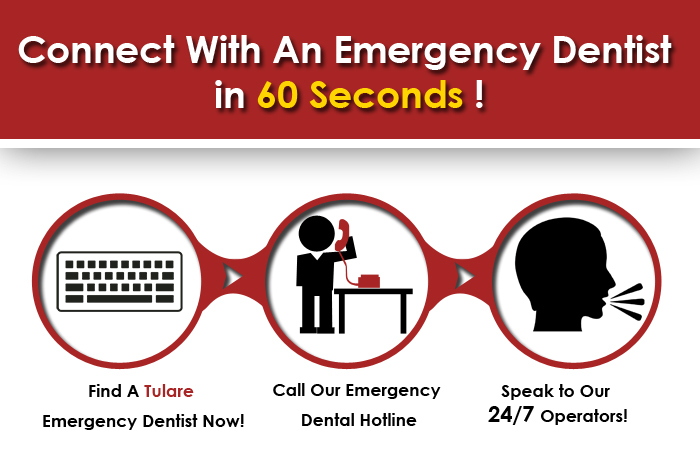 This unique directory is made for an individual to help obtain an emergency dentistry office close to you, though if you wish to skip the additional labor of calling every single dental professional, make use of the 24 hour emergency dental phone line we offer and be connected to an emergency dentist in seconds. Allow us to solve your after hours dental situation with the 24 / 7 dental care phone service we’ve provided to connect you with a local dentist. To find Saturday and Sunday dentists we scoured the entries of emergency dentists in Tulare and then outlined only the dentists that we know to provide Saturday and Sunday or night time working hours. A distinctive market has developed offering oral health treatment services to individuals in need of assistance. Directions Various Dental Treatment centers in Tulare, We Recommend you! Services Call today, Twenty-four hours a day and 7 nights a week to speak with our own emergency dentist Tulare CA phone services. Our providers will assist you while researching to find the best dental practice to serve you in dealing with your dentistry urgent situation. Be it a night time dentist, a Saturday or Sunday dental practitioner, or perhaps a dentist whenever, we are the Tulare emergency dental clinic referral service you need to work together with! The partnerships we’ve developed permit us to be associated with countless urgent care dental practitioners in the states. David S. Humerickhouse, D.D.S., Inc.
Doctors:-David S. Humerickhouse, D.D.S., Inc.
Summary David S. Humerickhouse, D.D.S., Inc. has a professionally trained staff that’s respectful and able to assist you in your urgent dental care requirements. Their staff provide professional services for root canals, dental crowns, and tooth extractions. Description John K. Sullivan, DDS provides a higher level of customer satisfaction with their emergency dental working hours, please simply call in advance and you’ll be accepted as a brand new patient. Description Cameron Torabi, DDS embraces brand new patients, especially those in search of immediate care dental care, please call before your session. As patients are traveling across the nation and on the many highways in between cities, there are many situations during which they may find themselves struck down with a dental emergency. One of the most frustrating things to ever have happen to you is be awakened in the middle of the night with urgent tooth pain, and feeling like you have nowhere to go. You can use our portal to help you immediately locate an emergency dentist in Tulare CA, when everyone else is close, or referring you to endless voicemail loops telling you they are not open again until Monday morning. Don’t spend an entire week missing your obligations because of tooth pain, and get in touch with us today! Hopefully this was a successful effort to find an emergency dentist in Tulare, CA and we were able to aid! Make sure to participate in some investigation of any dental practice you’re planning on going to, we advise utilizing Tulare Chamber of Commerce Dentist Page.